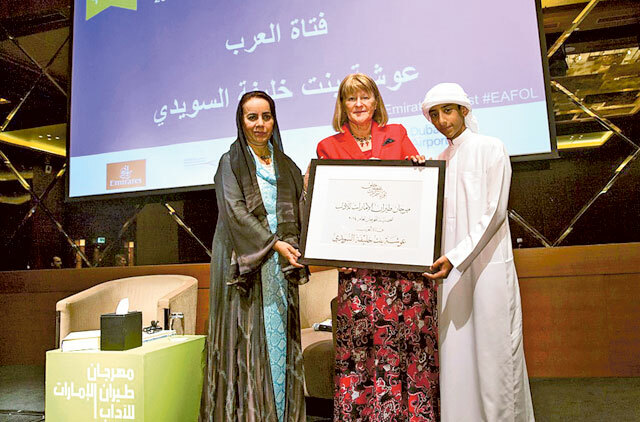 Dubai: Pioneering Emirati poet Ousha Bint Khalifa Bin Ahmad Al Suwaidi was honoured with the Emirates Airline Festival of Literature 2014 Personality of the Year award on Saturday in recognition of her contribution to Arab literature. Ousha was called the “Girl of the Arabs” by His Highness Shaikh Mohammad Bin Rashid Al Maktoum, Vice-President and Prime Minister of the UAE and Ruler of Dubai, after he conducted a series of poetry recitals with her. Ousha has been known for her Nabati poems that have also been turned into songs. Nabati poetry, also known as “people’s poetry” and “Bedouin poetry” has been part of the Arabian Peninsula since the 16th century. The short verses depict the reality of everyday life peculiar to the area. Dr Rafia Ghubash, founder of the Women’s Museum and Ousha’s official biographer, accepted the award on Ousha’s behalf from Festival Director Isobel Abulhoul at a ceremony held on Saturday. “It is truly humbling to be awarded for doing something I love and I would like to thank the festival for this honour,” Ousha said in a speech read on her behalf by Dr Rafia. “Literature has always been a part of my life but it was poetry that gave me the opportunity to express myself fully. I have seen the power of poetry transform and develop people, society and nations,” she added. Ousha comes from a family that loved literature. During her youth, she had the chance to interact and listen to many poets as they recited their poetry. At age 15, Ousha began reciting poetry and quickly received recognition for her gift within the community, which at that time was hugely male-dominated. She then went to on write her own poems touching on topics like wisdom, patriotism and love. Ousha gained recognition from Shaikh Zayed Bin Sultan Al Nahyan who commended her for her work in highlighting the emirates and the local language through her poems. Sharing their love of poetry with Ousha, the country’s top 24 young poets bagged their awards at the Taaleem Poetry Award on Saturday. Their winning poems with the theme ‘Metamorphosis’ in Arabic and English were published in a dual-language book that was also presented to them.